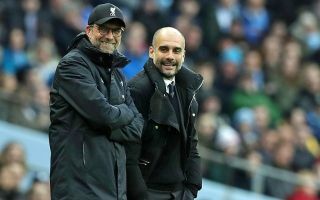 Amidst all the Carabao Cup final madness today, there was some good news for Liverpool in their Premier League title race against Manchester City. The Reds went top of the table today with a 0-0 draw against Manchester United, but City picked up their first piece of silverware for the season later on in the day. Pep Guardiola’s side also drew 0-0 in their match with Chelsea, before winning 4-3 on penalties at Wembley. However, the bad news for City is that key duo Fernandinho and Aymeric Laporte have picked up seemingly quite bad injuries. Goal’s Nizaar Kinsella has quoted Guardiola as saying both players could be out for ‘weeks’, in what could have serious repercussions on this title race. Some of City’s worst form this season came when Fernandinho missed a few games through injury earlier on in this campaign, while Laporte is another important player they’ll be gutted to lose. Liverpool will hope they can take full advantage of this as they need all the luck they can get to land themselves their first title in 29 years.